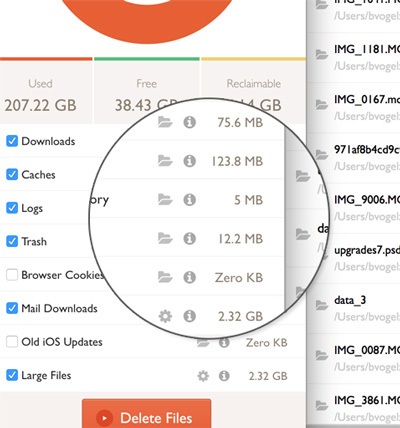 HD Cleaner helps you get rid of those useless files so you can have more room on your hard drive. Scan your home folder and free up your hard drive space for the important things. All it takes is a few clicks and the app will handle everything else. 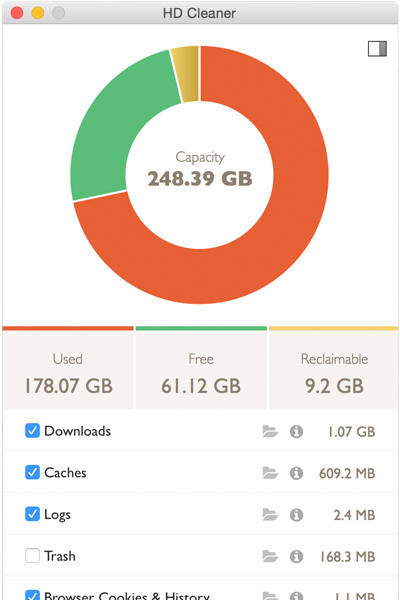 It's so easy to free up gigabytes of space within minutes. "Works fast. Works well. Very happy with my purchase." "Nice little app. Works fast, quick, and easy and I was able to reclaim quite a bit of space." "So quick and easy. Best purchase I made in some time." "User Friendly… easy to use… it works"
With HD Cleaner, you can quickly access and learn more about what files you'll be deleting. Click on any of the folder icons to instantly see the files that will be deleted. With checkboxes you can customize what you want to delete based on your needs. Email the developer at benvogelzang@gmail.com if you have any questions, comments or concerns. You can also use the form above.